Only 30 minutes drive north of Puerto Vallarta Airport is a beautiful fishing village of Sayulita, surrounded by green hills and white beaches. A place for many kind of relaxing vacation. The house 'Casa Mar y Montana' was built in 1999 and extended/upgraded since than. A large pool was built in Dec 2018 and garden remodeled. It is overlooking the ocean, mountains and town. It features 2 individually decorated charming studios with king-size beds, a lounging area and private bathrooms. The kitchen with dining area is perfectly equipped and offers a beautiful back patio with barbecue and a flowering vine roof. Beautiful ocean views are enjoyed from all windows and patios. A fully furnished patio roof offers an additional dining area, a single bed and a hammock. There are numerous places to relax in privacy in and around the house and the tropical gardens. Due to its hillside location you will enjoy a gentle breeze from sunrise to sunset all year round. More info click link below to view our site. Depending on season, you can eat bananas, lemons or papayas from our garden. House and garden maintenance are provided during the week. The road to the house is cobble stoned, thus easy access with any car and a large private parking area is available. Each unit is now furbished with a safety box. Cellular reception is now in town. An outside bbq area is now available with great views. Nice location and spacious house, Large property, lush vegetation and maintained garden area. WiFi based, good quality (confirmed by renters). Remark: For quality problems and even blackout caused outside the property, the owner can not held be reponsible. Full equipped for short and long term stay. 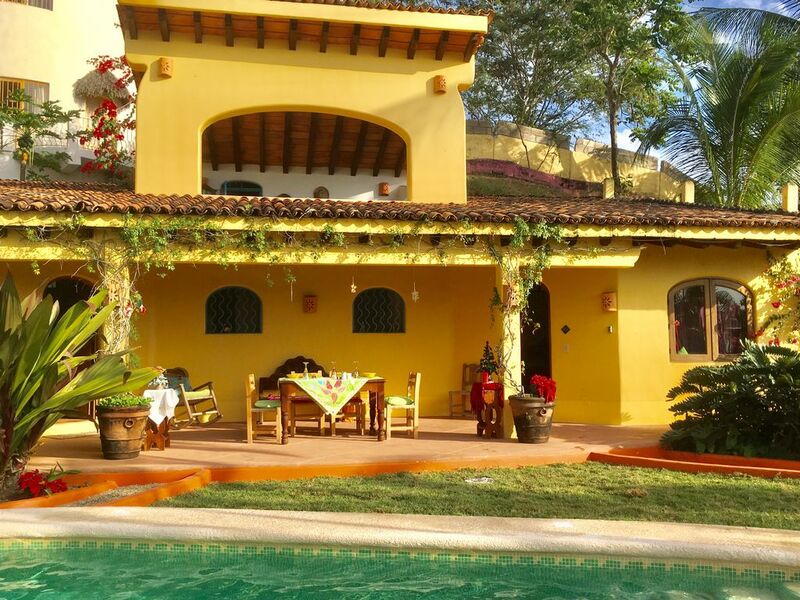 Casa Mar y Montana presents a sunny appearance with a lovely outdoor space upon arrival and is conveniently located near the town square. The house provides two guest suites and a lock-out kitchen; one suite is attached to the kitchen while the other requires accessing from the other side of the house. I would recommend this house if you are on a budget, traveling with family or friends, and plan to share the entire house. Otherwise, your experience with sharing the house may be mixed - as was ours. We were originally told we would have the house to ourselves but then were told we would have other guests arriving four days after our arrival. As the house was unoccupied when we arrived we hoped to be able to have the suite attached to the kitchen but were not given the option to choose. Still, we were able to enjoy the house, kitchen and outdoor spaces until the other guests arrived. They were very nice people but quickly took over the kitchen and outdoor spaces (leaving clothes and shoes on outdoor furniture), and made it awkward to share. It was not easy to share the kitchen and so we ended up going out the rest of the time and throwing our food away. As for the physical comforts of the suites, the rooms are large but dark and have inadequate lighting. The sheets and towels are worn; the shower doesn't drain and there is only a small RV-sized water heater for the entire house. It is barely adequate for a single shower so plan on cold showers. Finally, there are two very steep hills you must climb to reach the house. We are active and so it wasn't an issue for us but if you are not, please be mindful of this and perhaps plan on renting a golf cart if you need to. The house was very comfortable and offered multiple outdoor places to relax, read, and enjoy nature. The hills to the house were a challenge but we were proud of ourselves for climbing them everyday and trimmed our legs in the process! We always felt safe. The pink bedroom could use a better reading light, but other than that everything was as advertised. We would stay again. Thank you! Perfect location-Beautiful Home-Everything you need and nothing you don’t! On our first time to bring our children to Sayulita and it was perfect! Casa Mar y Montana is just what we were looking for - simple, rustic, authentic. The steep hill to the house was a bit challenging at first, but each time we walked it, we made it a fun workout!!! By the end of the week, we were running/racing to the top/house! Sitting outside in the mornings with coffee is a treat in itself watching and listening to the birds! The panoramic view is outstanding as well! Walking through town to the beach never gets old either! Don’t hesitate to go with this one...it is a lovely, big, simple, beautiful home with everything you need and nothing you don’t. Great property, great location. Owner and on-site manager very accessible. Just be aware of two blocks of steep walk up last hill to property. Great exercise! The property manager lives in the village, she speaks well english. $55-$140/nt, $275-$983/wk, $1440-$23400/mo depdning on season and duration, units Rates per vacation unit:in USD Winter (Oct 15 - Apr 14) 80 /night, 400/week, 1200/month Summer (Apr15 - Oct 14) 55 /night, 275/week, 825/month. Rates for House in USD Winter (Oct 15 - Apr 14) 140 /night, 782 /week, 1950 /month Summer (Apr16 - Oct 14) 95 /night, 475 //week, 1250 //month Christmas & New Year (Dec 15 - Jan 15) Add 20% to winter rates A down payment of 50% is requiered to secure a reservation, the remaining balance is due 6 weeks prior to arrival. For cancellation terms, please contact house owner.